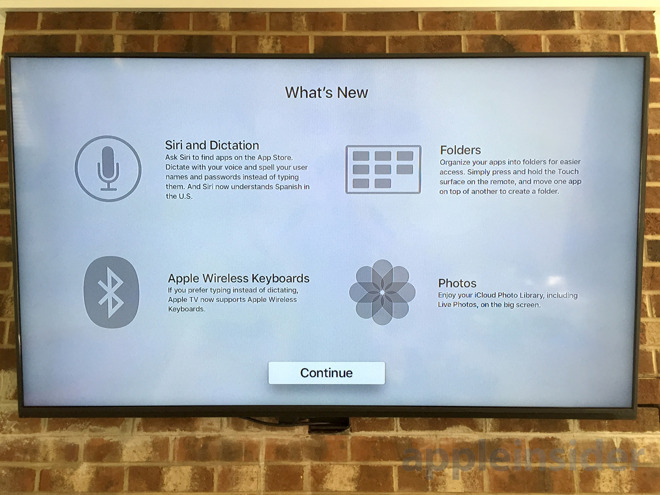 As promised, Apple on Monday released the finished tvOS 9.2 update, making a broad assortment of improvements to the fourth-generation Apple TV. Users can now, for instance, use the Siri Remote to dictate text into text boxes, including login screens and search fields. Input has also been made easier through support for Bluetooth keyboards. Elsewhere the software has gained an iOS 9-style app switcher, and support for grouping apps into folders, cutting down on home screen clutter. Some other enhancements include the ability to ask Siri to "search the App Store," and better video scrubbing. A video must now be paused before scrubbing will work, whereas users could previously bring up the option accidentally simply by touching the Siri Remote's touchpad. tvOS' Photos app has been hooked into iCloud Photo Library, letting users see photos and videos uploaded from other devices. Although tvOS can be set to fetch 9.2 automatically, users can also force a download by going into the Settings app and locating Software Updates under Maintenance. Apple has separately released OS X 10.11.4, iOS 9.3, and watchOS 2.2.